Since being used to extend telegraph services across long distances, relays have become ubiquitous within the equipment, products, and devices that permeate our lives. From turning on televisions to starting automobiles to controlling indoor temperatures, these electromechanical devices are applied whenever circuit control is required by a low-power signal or if several circuits necessitate control from a single signal. LynTec’s RPCR relay panels add branch circuit and remote control capabilities to any existing breaker panel. Equipped with motorized circuit breaker control systems, the Web-enabled panels can be used for LED lighting, powered amplifiers, and energy management programs. The omnipresence of relays also exists within commercial installations, including today’s audio, video, and lighting (AVL) systems. With the rapid emergence of new technologies such as LED lighting fixtures, many theaters, stadiums, and other AVL venues are looking to upgrade lighting and related systems, in addition to adding powered speakers or line arrays. Like any other powered solution, these systems require connectivity to standard electrical outlets in order to receive current. However, in order to ensure adequate operation and power control, how can users switch these new systems on and off? Some obvious solutions would be to hire the expterise of an electrician to connect each circuit to a separate wall switch, or simply use circuit breakers to turn circuits on and off, thus activating and deactivating connected systems. While these two options may seem like no-brainers, they are actually ridden with challenges. E.g., when installing new wall switches, which onsite personnel become responsible for physically turning them on and off? The same problem applies to the actual breakers, which would require repeated manual switching from users. Furthermore, only highly specialized circuit breakers are certified under the UL SWD rating, making them the only devices deemed safe and suitable for use as switches since most circuit breakers are not designed for repeated on/off operation. Using breakers for switching can also dangerously affect their ability to perform their primary function: protecting circuits from faults and/or overloads. This raises the possibility of electrical damage or trips. So how can users obtain both protection and control for AVL systems and devices? A wide range of manufacturers currently offer relay cabinets that combine low-voltage control with high-voltage switching, resulting in control of between four and 64 circuits within a single enclosure for extremely wide-reaching system control. 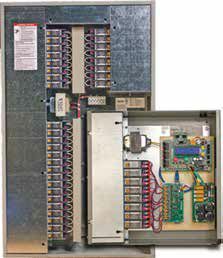 Typically located near existing circuit breaker panels, relay panels are also extremely easy to wire and install. Professionals simply disconnect the active branch circuit wire from the circuit breaker and reroute the circuit breaker output through a relay before sending it on to the controlled circuit itself. Most relay panels can be controlled by one push button or control protocol that starts a sequence to step through the relays, turning them on or off in the proper order. Popular forms of control for today’s relay panels include third-party systems for use with protocols including DMX-512, RS-232, or TCP/ IP — resulting in networked browser-based setups, monitoring, and control over Ethernet connections. Users are then able to access relay panel platforms via an IP address and set up electrical management programs through point-and-click capabilities while monitoring and activating/deactivating specific circuits. Since these systems are on a network, adding a wireless router to the infrastructure provides instant compatibility with portable devices for flexible browser-based control. More advanced systems even allow router configuration in order to provide an external IP address for the relay panel controller, enabling anywhere/anytime remote monitoring and control capabilities wherever Internet connectivity is available. For AVL systems installed within schools and other permanent or temporary assembly spaces, relay panels are becoming essential components for advanced powered solutions. Beyond providing protection from surges by removing the controlled devices from the power source when they are not in use, remote relay panels enable energy savings, on/off control, and install flexibility, in addition to extending the lifecycle of professional equipment — sending power to systems only when required. Mark Bishop is the owner & president of LynTec.